Some small edits made to Tyrant597's Mass Move Marines to allow mass movement of Service Crew instead. Tyrant597 had a great mod when they created Mass Move Marines (hopefully Egosoft will implement this feature themselves soon). However, (as the name implies) it only works for marines, not service crew. I made a few simple tweaks to the original scripts to allow service crew to be mass moved. ﻿Just comm one of the service crew on the "source" ship, and choose "Mass Move Service Crew". Then select which ship you would like to send service crew to. The target ship will be filled with as many service crew as possible. Should be compatible with anything (this includes Mass Move Marines). 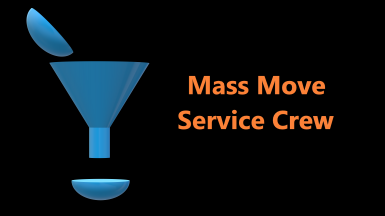 Download the file, extract the "MassMoveServicecrew" folder and move it to your extensions folder. I don't mind if you use my changes in your mod, but please ask Tyrant597 for permission as most of this code is their work!